Baby Wallace Blog: Make Up Posts Are the Best. Make Up Posts Are the Best. This post is coming a day late. To make up for that, I should make it a super post, 10x funnier than usual. But that's not happening, so, begin being let down. Most of the negligible laughs on this site come from observational humor and making fun of people. Ya know..... high class stuff. 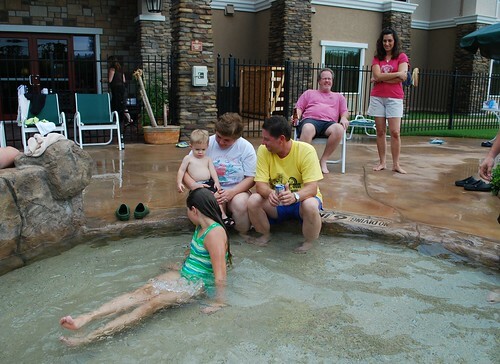 Since Riley and I spent the weekend at a family reunion, making fun of our surroundings probably isn't a good idea. Yet I'll persevere under these chains. 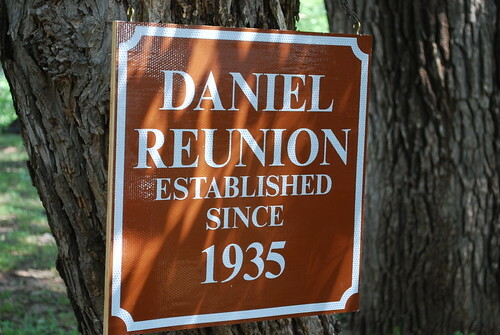 Every year since at least 1935, the Daniel family (my Dad's paternal grandmother's side) has had a family reunion in the same pasture in central Texas. We went most of my childhood years, but I've only been twice in the last 10 years. 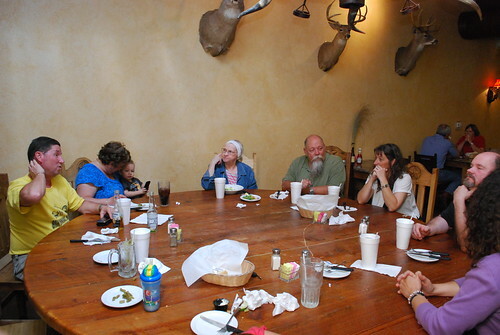 The location is about a half hour out of a town with 3,000 people (Hamilton, Tx) and about 50 minutes from the closest Wal-Mart (Stephenville, Tx). Its about a rural as rural can be, but not in a bad way. The stars aligned this year so that just about everyone in my dad's family could make it. Unfortunately one of the people who couldn't was Joan because she is a big important lawyer with a big important case coming up. I was Mr. Mom all weekend, but had a good support staff. We headed out Thursday afternoon with my Mom and Dad along for the 6 hour drive. 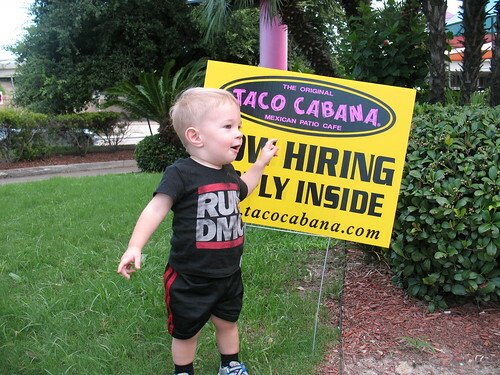 Riley got to have his first visit to a Taco Cabana, the restaurant I WILL bring to Lafayette if this legal thing falls through. Unfortunately, their breakfast is far better than their dinner, but it was still worth the stop. After a pretty uneventful ride, we made it to the Inn at Circle T Arena. It is a very nice and visually interesting hotel in the middle of nowhere situated next to a nice rodeo arena, saddle shop and restaurant. It is almost a startling sight as you come over the hill and see it there because there is nothing else like it for many many miles. Riley made the trip fine and even slept better in the hotel than at home. Friday morning we hit the breakfast mini buffet and he proved to me a universal truth of childhood. 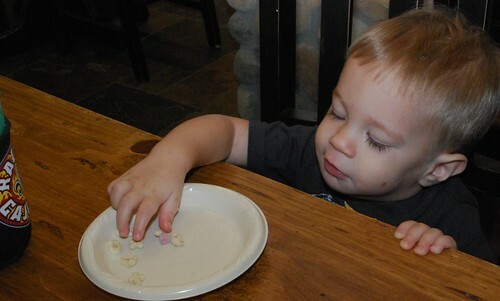 It is a fundamental truth that a child, presented even with his first plate of Lucky Charms will proceed to pick out all of the marshmallows. 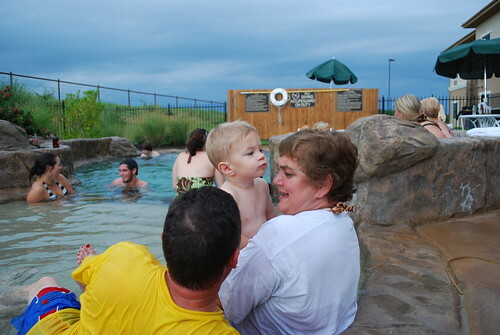 Then we toured the pool, which is small but pretty neat. 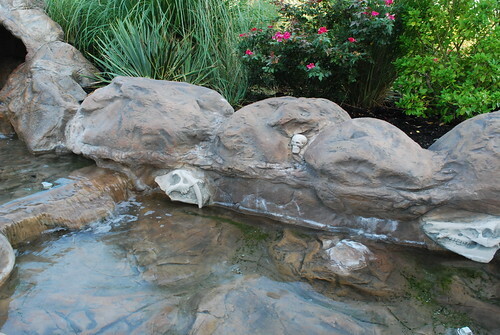 It has a waterfall and stream lined with fake fossilized skulls. 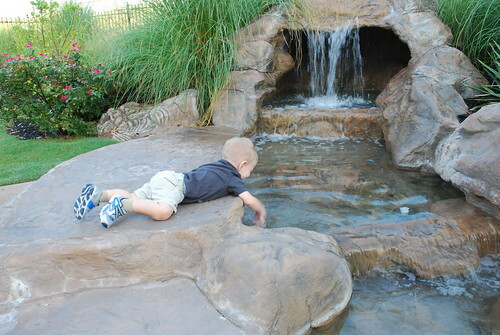 He enjoyed splashing away and making me think he'd enjoy swimming, but more on that idiotic thought later. For lunch we hit up a local, rather mediocre mexican restaurant that locals highly recommended. I really do feel sorry for people that don't have the fabulous dining options we have around here, and I promise never to take those for granted. 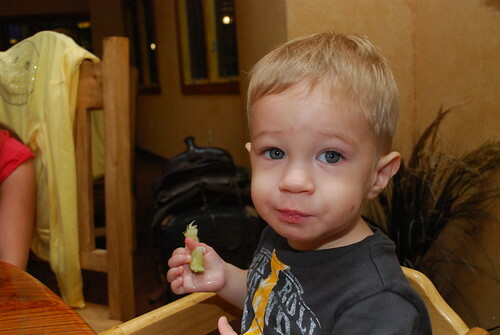 While the food didn't make an impression, it did give us a chance for Riley to show us how impressionable he is. 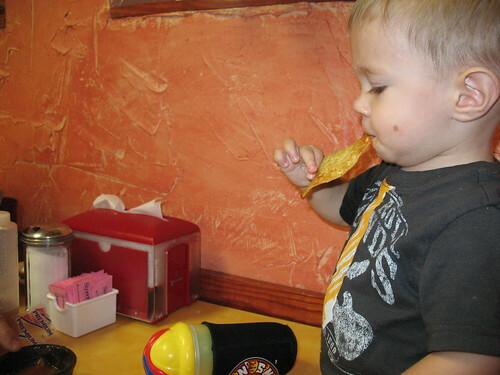 Without any prompting, but after having been to approximately 275 mexican restaurants in his first 16 months, he reached over to the chip basket, grabbed some golden crispiness, dipped it in the sala bowl and put it in his mouth. That's ma boy. He may not be a genius, but at least he'll never starve. Some people would actually call that lack of ability to drink properly, but I want to keep a positive spin on things. 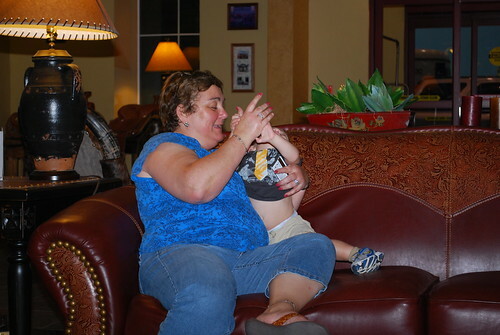 He had much more fun back at the hotel, playing in the lobby with Nonnie. It even led to a very opportune shot just as he tripped and accidentally drove his teeth into her knee. Ah the wonders of shutter speed to capture a moment in time. That evening, our most far flung relatives arrived from Connecticut. 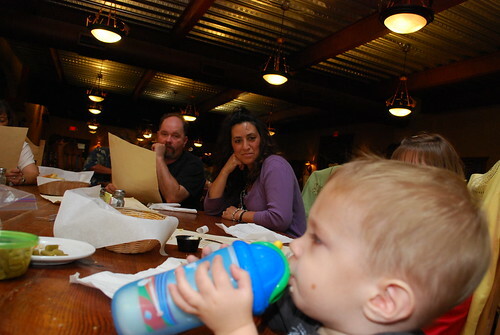 Uncle Darren, Aunt Sangee (loyal blog reader) and Cousin Hailee had only ever met Riley once and it was at the very beginning of his stomach troubles and colic, making for quite a miserable visit. He had lots of making up to do and didn't waste any time doing it. 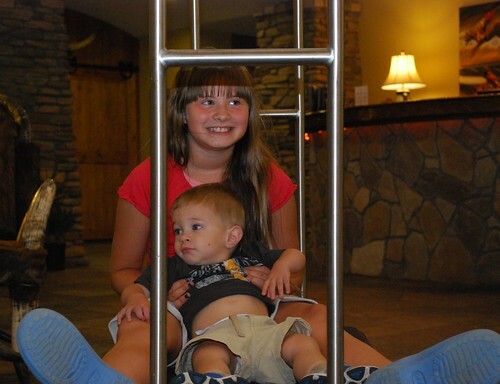 Within a few minutes, he was showing his citified upbringin by riding the luggage carts around the lobby with Hailee then heading over to the saddles to pose away. 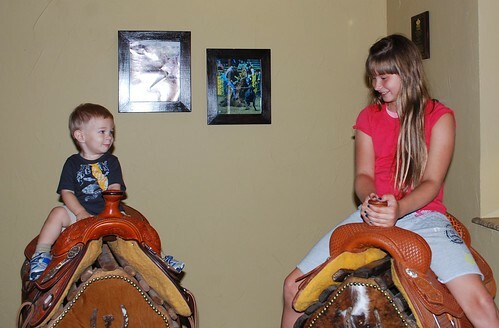 Once everyone was loaded in, we headed across the parking lot to a restaurant connected to the rodeo arena, where Riley and Hailee got to watch some barrel horse racing and even pet a couple of horses. He had a captive audience for a little while and dazzled away with his amazing contorted faces and lime eating abilities. After dinner, the small bar outside of the restaurant had transitioned to nightclub mode and was blaring away a dreadful mix of today's most popular modern twang-pop hits. He showed off for the cowgirls by demonstrating his dancing skills, which could quite easily be mistaken for a physical handicap. Fortunately, to save his chances at ever marrying or keeping friends, it was too dark to get pics. It was really neat to be out in the country and have wide open skies and nice sunsets. 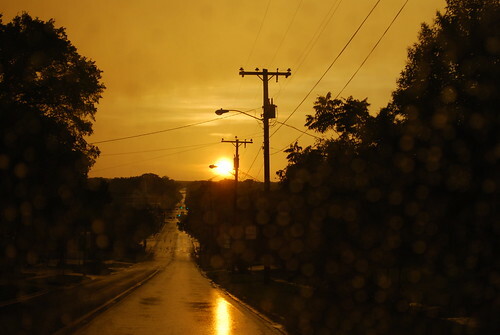 Plus, storms in the area made for some really interesting skyscapes. 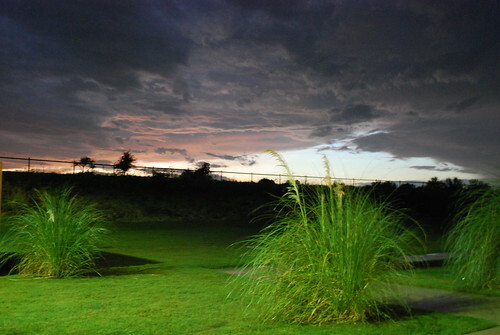 This first shot was taken after 9 pm. The reunion was way more hopping the next day, with lots of people we know and even more that we don't. We got to see some old favorites (old not meant derogatorily) and my 75 year old grandma got to see some inlaws and cousins that she hadn't seen in quite a while. 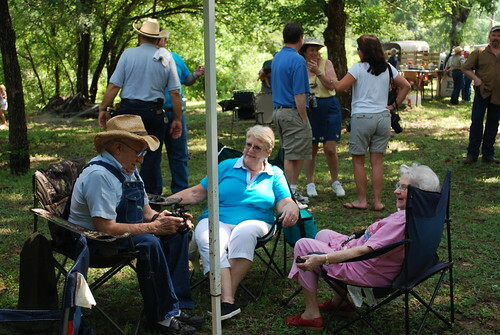 One lady even showed up not knowing anyone, but having done genealogical traces back to the Daniel family and hearing about the reunion. 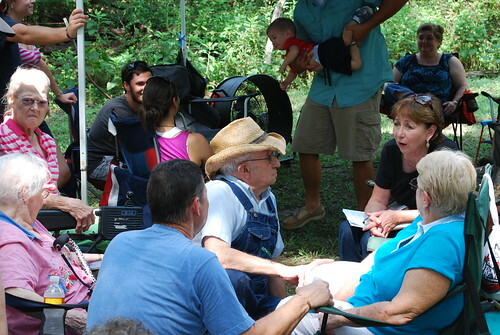 She was hopefully able to get alot of practical, real life information from some of the more seasoned citizens like Uncle Jerry. 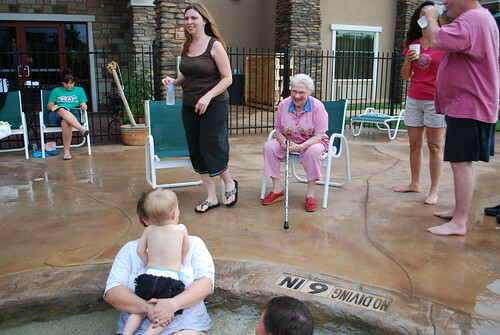 Riley was mostly interested though in just hanging out with Nonnie and Hailee and getting sprayed by Aunt Sara's pregnancy strength misting fan. Sadly, our time out in the country was cut short by some unusually bad weather that actually ruined some of my camping equipment. That gave us the chance to head back to the hotel and have what presidential types would call a "beer summit" around the pool, with plenty of Fat Tire, which isn't available in Louisiana. Riley, despite making indications that he may be interested in the water, continued his severe hatred for pools, even in the 6 inch kiddie section. 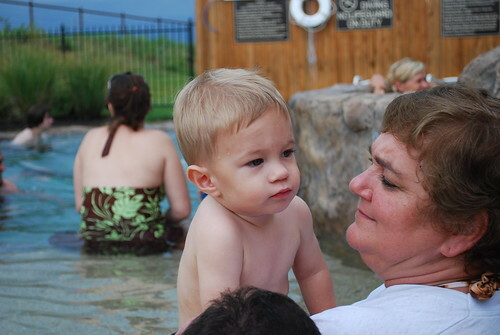 He mostly just wanted to hang out with Nonnie and knock Cousin Hailee over. 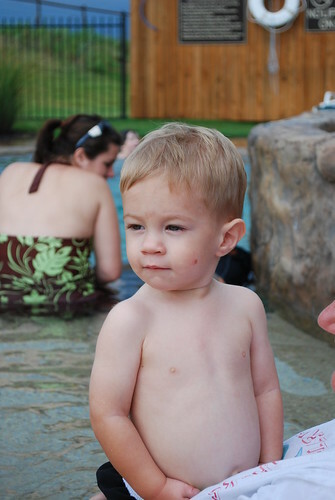 Even after he figured out that it was fun to stick his face in the water and blow bubbles, he still didn't want to stand in it. Like I said, he may not be a genius, but at least he won't starve. 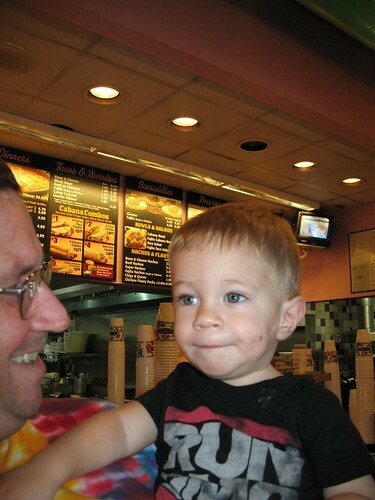 That night we headed to a local mediocre burger joint highly recommended by the locals. 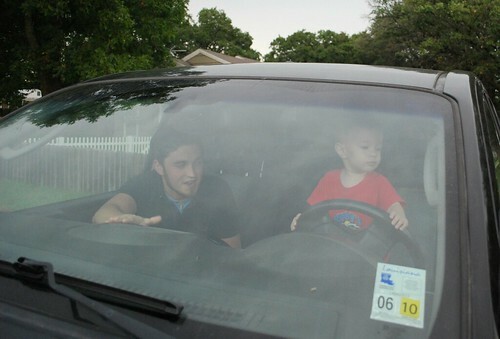 While waiting for the whole crew to get there, Riley pretended to drive. 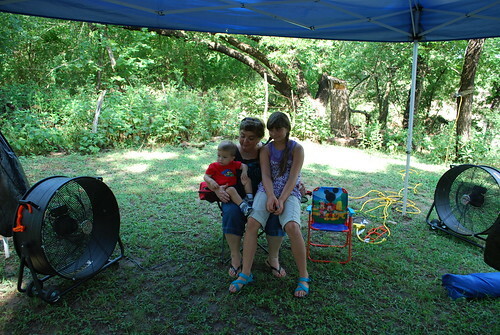 He then, using his passion for spinning objects, showed the most important driving skill-- how to crank up a good Rage Against the Machine song, thus leading to him, Eli and Amanda having a good impromptu air jam session. 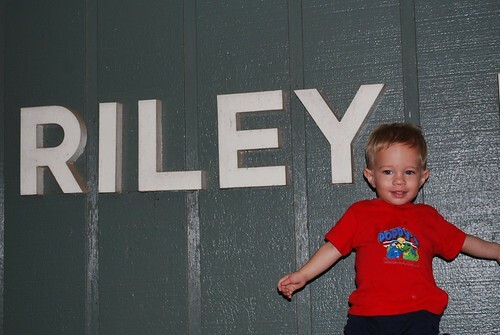 After dinner we stopped by Riley Funeral Home and got a couple of pretty neat shots. Later, as I was washing dishes and he was playing in the room, I noticed that he was kinda quiet. That didn't last for long and I soon heard him, but his voice seemed distant. I stuck my head out into the room and he was gone. He used his new-found door opening skills to escape the room and go off on a search for his Nonnie. 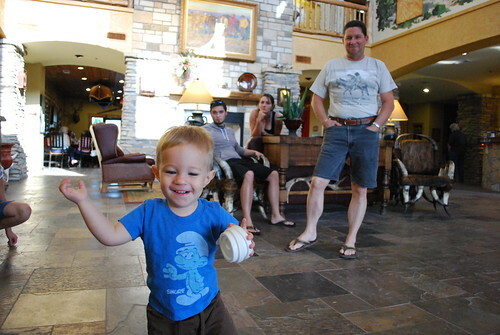 Since he had been playing in the lobby earlier and the staff knew him, they were laughing as I came running down the hall to catch him blazing across the lobby. Fortunately, slate floors, rock walls and 40 foot ceiling really accentuate his volume and he was easily traceable by sound. Unfortunately, the next morning was time to go. He let me know that by trying to put my shoes on. The trip back was pretty uneventful. He watched Nemo once and Jungle Book almost twice. But he had two important firsts. 1. He stopped by HEB, the coolest grocery store that I wish we had. 2. 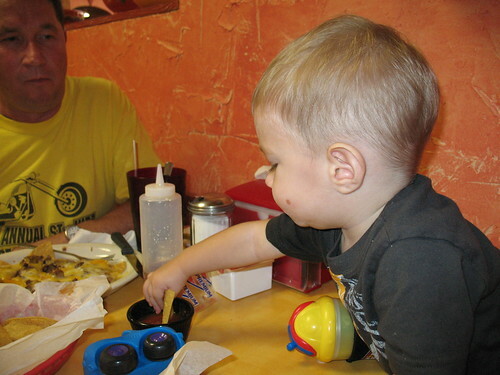 He got to eat at his first Pancho's Mexican Buffet, an option now sorely missed on the Lafayette dining scene. 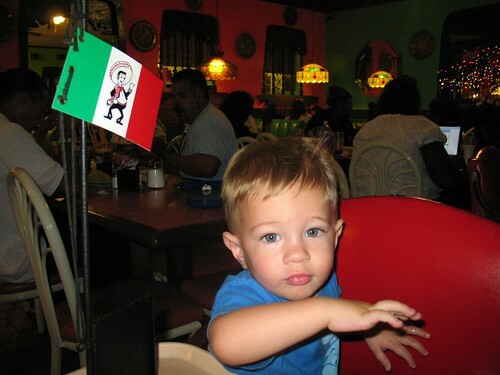 He even got to raise the flag for sopapillas. That's about it, from what I remember. 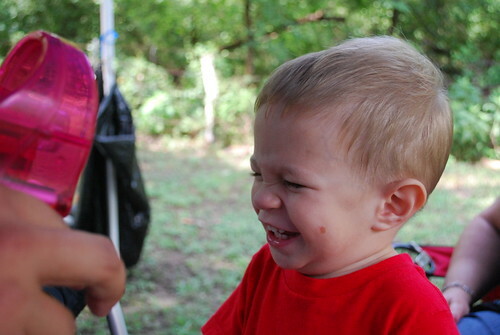 He was happy to see his Mommy when he got back and she was happy to see him. I'm sorry if you're not happy after reading all the way through that but thers's always next week, or the week after that, or the week after that. i'm sure we'll have something funny or interesting come up in the next few months. Good thing my tea was still hot! Thanks for the laughs! 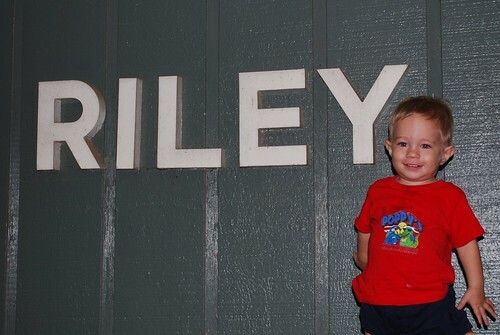 Riley is precious and a little stinker!